Paul O’Connor reviews a new biography of a 19th-century immigrant who battled discrimination against himself even as he fought for freedom for those who were enslaved. THE IMMORTAL IRISHMAN. By Timothy Egan. Brilliance Audio. 14 hours, 9 minutes. Read by Gerard Doyle. $11.95 Audible Download. Also available in paperback. Mariner Books. 384 pages. $15.95. Some lives just don’t turn out as expected. Thomas F. Meagher was born into the small, fortunate sector of Irish Catholics who in mid-19th century Waterford could afford to eat, wear clothes rather than rags and enjoy a formal education. The son of a successful merchant, he would have been expected to live well despite the crushing rule of the occupying power, Great Britain. But Meagher didn’t take that path, and National Book Award-winning author Timothy Egan has produced a fascinating, inspiring and infuriating biography of this man, a book that is hugely relevant today. 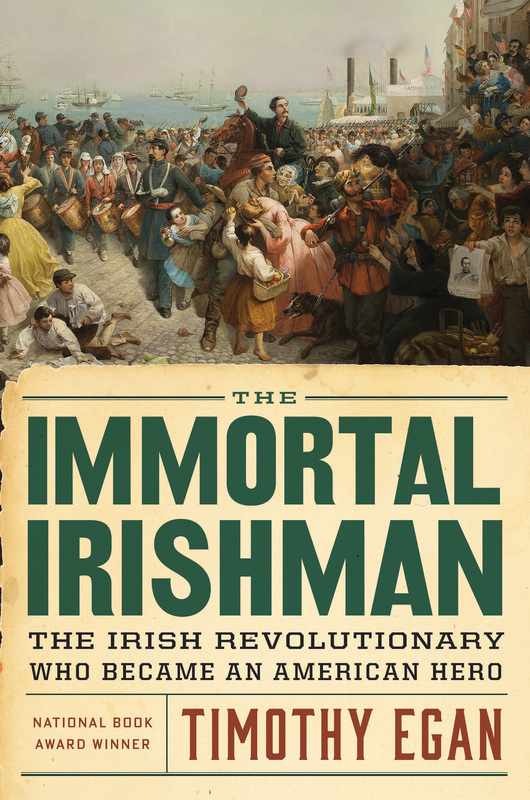 Meagher, who many considered the finest orator of his generation, ventured into the Irish independence movement as a teen, joining the radical Young Ireland movement. Captured by the British after a failed rebellion in 1848, Meagher was eventually sent into lifetime Tasmanian exile from which he eventually escaped. He came to the U.S. and instantly became famous. He traveled nationally on speaking tours during the 1850s and was widely seen as the leader of the Irish expat community. When the South rebelled, he led the New York 69th, otherwise known as the Irish Brigades, as a general in the U.S. Army. After the rebellion, he would head west, where he served as acting governor of Montana until his death. Through the many stages of his life, Meagher fought for one principle: freedom of the enslaved. First, in Ireland, where he fought against the British overlords who intentionally allowed the Irish population to starve during the potato famines, then in the Civil War, where he made clear that his purpose for joining the Union forces was to free the slaves. Finally, in Montana, where a vigilante cadre maintained power through violence, he fought to bring law and order for the vast influx of immigrant mining labor. Although Meagher could escape from British imprisonment, he could not get free of the pervasive prejudice against the Irish. In the 1850s, he was the target of vile attacks from the Know Nothings who wished to restrict immigration from Ireland and other non-Anglo Saxon countries. Egan recounts the discrimination directed at Irish immigrants in infuriating detail. One can only hope that any Americans claiming Irish heritage today would consider what their ancestors went through then and feel some empathy for today’s immigrants. Writing the biography of such a gifted writer and orator must have been a challenge, but it is one to which Timothy Egan rose. His words flow beautifully, as did Meagher’s, and in the audiobook version Irish reader Gerard Doyle provides probably the best performance it has been my pleasure to enjoy. So, as we enjoy St. Patrick’s Day this week and as our president continues his harsh and cruel policies against immigrant populations, we have this wonderful, highly acclaimed book to which to turn for inspiration. Paul T. O’Connor is the North Carolina statewide political columnist for the Capitol Press Association. 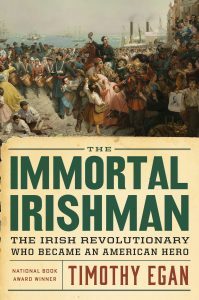 This entry was posted in American History, Audio Books, Biography, Contemporary Nonfiction, History and tagged Audio Books, Biography, Irish, The Immortal Irishman, Thomas Meagher, Timothy Egan. Bookmark the permalink.